We’re not sure if technology or urban sprawl is the reason, but kite flying has been on the decline since the 1990s. And, that’s a shame because a fun a activity that anyone of almost any age can enjoy. Not to mention, we have the perfect weather and public places to fly kites. First things, first… you need a kite. If you haven’t shopped for one in a while, the varying styles and level of sophistication might just literally blow you away. Start with a simple light-pulling kite for kids that they can easily hold on to in the wind. Several kite-specific stores in North County have recently closed, but local toy stores have them as does REI. Or, for more options than you can handle, try Kite Country on Sports Arena Blvd. Running is one of the worst ways to launch a kite because erratic jolting on the line causes it to dive and crash. Instead, stand with your back to the wind, hold your kite up until it catches the wind and let the line out as the kite goes airborne. If wind is sufficient, it should be as easy as that. However, mismatching wind to your kite is a common mistake so if that super fancy kite is calling your name, make sure you understand its requirements. Remember that the kite is your responsibility so fly it with care. Avoid power lines, trees, roads, people, flight paths and any other hazards. South Carlsbad Beach: Breezes in the afternoon are especially good for kite flying. Dog Beach (Del Mar): Be mindful of keeping the kite clear of Camino Del Mar. Oceanside Pier: Fly on the beach, not actually on the pier. Aubrey Park (Poway): Fly when games aren’t in progress. Or, head south to spacious Mission Beach, where the Kite Flying Club of San Diego meets. You also won’t be the only one flying kites in good weather at the bayside Embarcadero Park near Seaport Village. 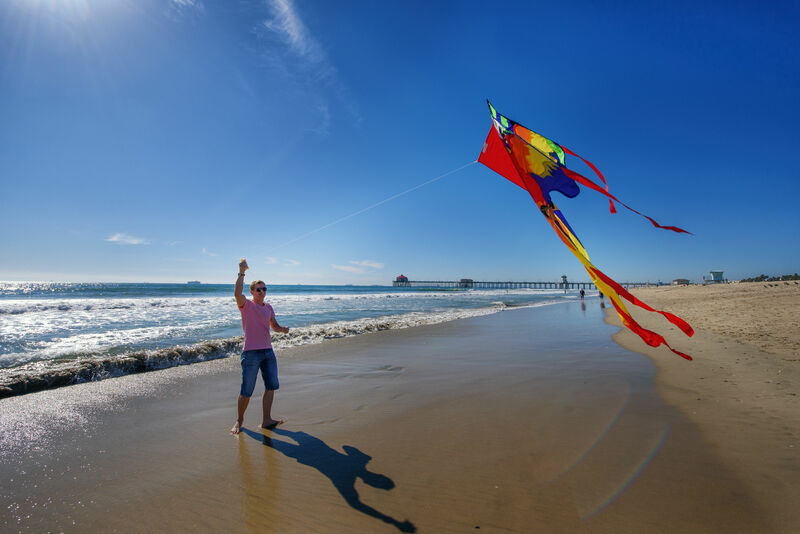 Where do you fly kites in North County San Diego?